Any true and passionate book lover dreams of one day having a library where he can spend all his spare time reading and admiring his book collection. Our client was no different. He wanted to covert his existing bedroom into a library and study which doubles as a bedroom. His existing space bore testimony to the fact that he was a voracious reader and collector of books and figurines. Books were stuffed in every nook and cranny possible, and he certainly owns more books than clothes! 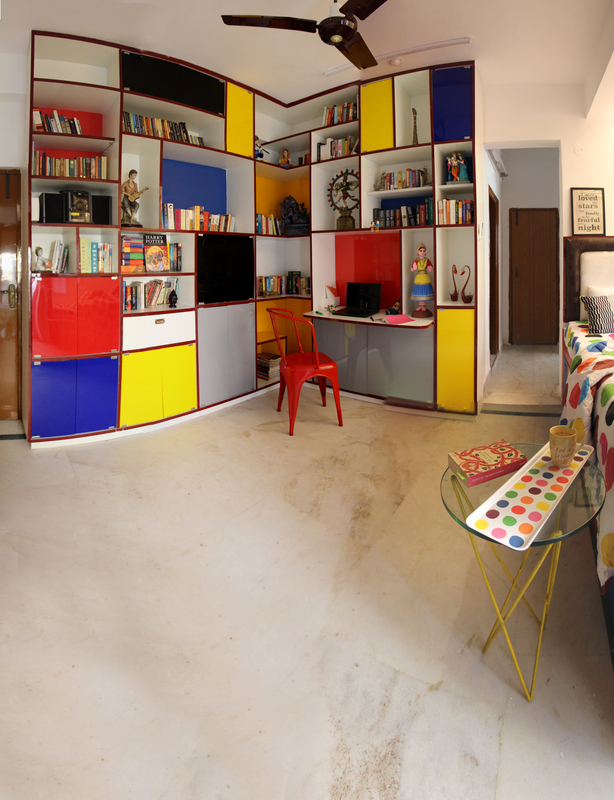 Since the client was a chartered accountant, we decided to play with grids and geometry, introducing pops of primary colors. Paintings by artist Piet Mondrian during the de Stijl period in art and architecture became our inspiration, both in terms of color and composition. Mondrian’s compositions have been interpreted in various ways, and we decided to grow the same grid into a floor-to-ceiling bookself. The existing balcony and wardrobe on two ends of the same wall were merged to make space for a niche bed with plenty built-in storage for books or clothes. The balcony was reduced to the corner with enough space for two people to stand comfortably. The wall of the balcony was brought down and UPVC and glass sliding doors were introduced to bring in as much sunlight as possible. The streamlining of these functions and built-ins created a vast space that could be used as a library. The shelves are of varying depths, as well as heights and widths, for all sizes of books as well as the client’s collection of figurines. A deeper ledge was introduced within the shelf to serve as a study desk. In order to maintain Mondrian’s rhythm of colors, the backs of some shelves and some doors are in color-coded laminate or acrylic doors.